At Raukokore there is a little white wooden church standing on the shore. It leans a bit and has to be propped up as it is hit by strong winds blowing off the sea. 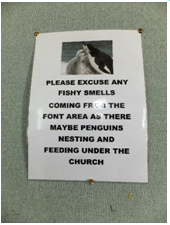 It also has an unusual problem around the font. We eventually found our coffee at Waihau Bay where the whole local population appeared to be out fishing as the road side and car park were full of cars and empty trailers. Heading towards our camp site at Opotiki we had excellent views of Whakaari (White Island) which is New Zealand’s most active volcano. It was smoking gently, reminding us that a night time eruption in 1914 killed all the sulphur miners living there. Now it is just home to a Gannet colony who don’t seem to be affected by the ash fall out. We slept well after a long and interesting day. We left Wellington before 9am and managed to get onto State Highway 2 without getting too embroiled in the rush hour traffic heading into the city on SH1. Passing several areas used for filming Lord of the Rings we climbed over the Rimutaka range through dramatic scenery. Avoiding the double trailer logging trucks on hair pin bends was a challenge. We resisted the temptation to detour via Stonehenge Aotearoa and the town with the longest place name (67 letters long with a string of 6 consecutive vowels at one point and totally unpronounceable) and continued north east towards Masterton. Sadly we were too early in the year for the Golden Shears sheep shearing competition. We made a coffee stop in Eketahuna, known as the white Kiwi town as it has a giant white Kiwi statue. The Maori name means “run aground on sand bank” as this was the furthest point upstream a canoe could paddle. Further up the road was a far greater attraction – the Tui brewery at Mangatainoka. Having enjoyed scones with our coffee we weren’t able to indulge in lunch here but it would have been rude not to try the beer. Tui is renowned for its beer and ironic “Yeah right” adverts which often reflect current news stories. One church “borrowed” the idea for an “Atheists have nothing to worry about – Yeah right!” poster but was threatened with legal action. Dannevirke is the centre of an area colonised by Norwegians and other Scandinavians and names in the surrounding countryside reflect this. At our lunch stop in Waipukurau we saw several vintage cars and seemed to come across them several times as we travelled on through Hastings to Napier. We camped at Bay View just outside Napier and met people who had congregated for a long weekend – the Art Deco Weekend, hence the vintage cars! We had completely missed this information when planning our trip and weren’t really ready to become immersed in all the activities and dressing up. However, it had benefits. We went in to town early in the morning, before things got busy, and enjoyed the sunshine and watching people beginning to arrive. There were lots of old vehicles, a steam train and shop keepers dressed in period costume. In the gardens of Clive Square a crowd of school children were dressed up and learning some history. In 1931 the city was levelled by a catastrophic earthquake and the fires caused by ruptured gas pipes completed the destruction. 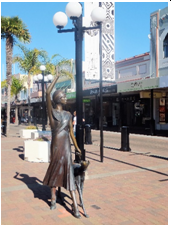 A well planned rebuilding programme saw the rebirth of Napier as a world famous, uniform art deco city. The style was cheap to build and safer if there were future earthquakes. We were about to abandon plans to visit the Cathedral at 9am when a lovely gentleman rushed over to open up for us and showed us round. Like most of Napier, the traditional brick built Cathedral and all its art and decoration was destroyed by the quake which struck as communion was taking place. Edith Barry was pinned beneath a wooden beam and was unable to be rescued before fire swept through the building. A doctor gave her a merciful dose of morphine as nothing else could be done – how sad. A temporary wooden building served the diocese for the next 25 years (shades of Christchurch?) and a new Cathedral was finally consecrated in 1967. 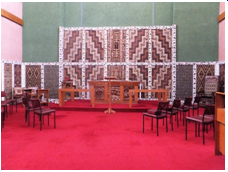 The altar was later moved forward to a central position and the sanctuary used to house the Maori Memorial Chapel. The art deco style of the new Cathedral is simple and effective so we hope that Christchurch will be able to combine the modern with long term style when new designs are drawn up. We walked down to Marine Parade and back into the main street as more and more people gathered and we were able to people watch as we had a coffee before hitting the road again at 10.30. I’d like to revisit Napier. Travelling north up the coast on the Pacific Coast Highway, we continued to see vintage vehicles heading to Napier so it was obviously going to be a busy weekend. After the buzz of the city we found a wonderful spot for a swim at Mahia Beach. There was no-one around and we wondered if we should be swimming but there were no danger signs or flags. The campsite office/shop served ice creams so we indulged ourselves. We are still smiling about the lady who served us. She was the cleaner and had been left in charge for the afternoon. Her ice cream servings were huge and she regarded the electronic till in the same way Ronnie Barker treated the till in Open All Hours. I hope they balanced the books at the end of her shift as our $4 charge read $400 on the screen!! Gisborne was our next port of call and we discovered where all the wood on the logging lorries finished up. The wharf was huge and wood everywhere. Gisborne is also the site of one of the first Maori landings and Captain Cook’s landing in 1769. He named it Poverty Bay as the locals weren’t friendly and he had to leave without the supplies he needed. The memorial at Kaiti Beach recounts the events and was paid for by all the school children of New Zealand paying 1d each. The Pacific Coast Highway continued to wind its way through scenic reserves with views across the ocean and took us to Tolaga Bay camp site. 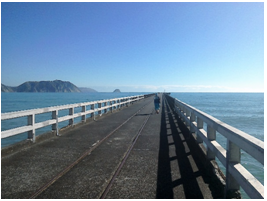 There is very little at Tolaga Bay but, as Lonely Planet says, “this is a place where absence becomes substance.” It is famous for having the longest wharf in the southern hemisphere. Built in 1929 to help keep the logging industry alive in the area, it is 660m long and enabled larger ships to berth in the shallow bay. It is being saved by local fundraising so we used it for our morning exercise the next day in glorious sunshine. Continuing up the coast we admired the views of the sea and the Raukumara Range, including the sacred Mount Hikurangi which, at 1752m, is the first place in mainland New Zealand to see the sun each day. There were no obvious coffee stops along this quiet stretch of coast, even at the Te Puia Springs where the thermal pools are in a shed and, although they are reputed to have the highest mineral content, there is also a risk of amoebic meningitis! 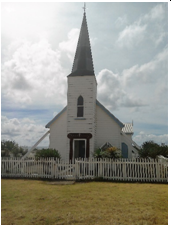 We fell in love with St Mary’s Church at Tikitiki. It was built in 1924 to commemorate the Maori servicemen killed in World War 1. It is very ornate with intricate woven panels of tukutuku (flax), carved wooden wall panels and traditional rafter patterns. 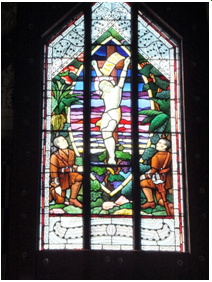 The east window was made in Christchurch and combines Maori and Christian concepts. The various carving styles on the pews, altar rails, pulpit and organ surround reflect the fact that they were made and donated by various different local areas, each with its own way of working. We were amused to see that the congregation had obviously provided their own seating in the pews as there was a wide selection of brightly coloured, mismatched cushions in each one. On Pukemaire Hill, above the church is a simple memorial marking the cemetery and honouring the Ngatipoou Maori Battalion. We stopped at Te Araroa before turning west along the coast. We weren’t able to drive out to the Lighthouse at East Cape (the easterly tip of mainland NZ) as the roads are unsealed and, once again we couldn’t take the hired van there. However, Te Araroa proved interesting. It is home to the largest Pohutukawa tree. 20m high and 40m wide, it is more than 350 years old and is named Te-Waha-O-Rerekohu. It stands near the beach in the schoolyard, complete with a notice asking you not to climb it! It must be quite a sight when it flowers with the red flowers in December which give it the a.k.a of New Zealand’s Christmas tree. Having seen a tanker delivering water to a farm up the road, we weren’t surprised to find the area hit by drought. Sadly this meant that there was not much on the menu at the dry café. So it was bottled water and toasted sandwiches for lunch. We drove on to seek the Trig Point Lookout overlooking Hicks bay expecting great views of the grand beach. I suspect the trees have grown a bit since its virtues were extolled on the map as we fought our way through undergrowth to find – nothing. Other visitors agreed so we headed back to the car park, disappointed.